Ever wondered where to find classic DVDs of British rock, blues, or the progessive works of Pink Floyd, Yes, or Tangerine Dream? Look no further than Voiceprint UK, home to an ever growing and an incredible array of vintage music from the British Isles. One of the best and most revered music documentaries of the 1960's enjoys it's long awaited release in this spring. "All My Loving" was filmed and produced in the late sixties and was one of the early directorial films from celebrated director Tony Palmer. 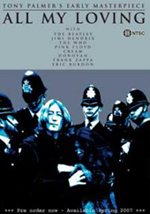 The film features rare footage of the Beatles, Pink Floyd, The Who, Cream, Frank Zappa and Jimi Hendrix. Considered a landmark release at the time, (1968), this film is shortly to be available on DVD. There are so many near forgotten greats of the sixties and seventies, that it's amazing so much of that footage has even survived and been digitally remastered by Voiceprint. Fans can visit their website, http://www.voiceprint.co.uk. One needn't worry too much about figuring out the pounds vs. dollars, they do it for you and the DVDs actually arrive in a reasonable amount of time. (16 pounds for a DVD comes to roughly around $30). Guitar greats like John Martyn, Steve Hackett of Genesis; Hawkwind; King Crimson and Asia alumni John Wetton and Steve Howe, are captured in a variety of live performances, and lovingly restored. Howe's fellow Yes alumni have been busy as well; Bill Bruford released his "BBC-Rock goes to College" DVD; and pianist Patrick Moraz has an archive release from 1995 and a live solo performance. The concert took place at Westminster Choir College in Princeton, New Jersey and captures Patrick’s piano work perfectly. Tracks include Blue Monk and the Intro from Best Years of Our Lives which was originally from epic "The Story of I". As with many of the albums in the Voiceprint series of re-issues, the artist have signed as well as personally overseen the re-mastering process for their releases. Rick Wakeman, who shot to fame playing the Mellotron behind Elton John, David Bowie, The Strawbs and Yes, had been "trawling" through his personal video archive in order to see just what he has got in there. As it happened there was quite a lot of footage, and he made a decision to release them as an “Official DVD Bootleg” in the forthcoming “Rick Wakeman DVD Archive Series”. The shows will include performances from the 70’s,80’s and the 90’s. There will also be one or two surprises and certainly some footage that was thought to have been lost. More details of the series and the contents will be released early in 2007 and it's hoped to launch the series within the first six months of the year. Tyneside legends "Martin Stephenson and the Daintees" are also recording a new studio album; their first since The Boy’s Heart album from 1992. The album although only in the early stages should be finished by March 2007 and a release date shortly after in spring. The album will feature Martin Stephenson alongside fellow founder members Anthony Dunn and Gary Dunn. The band also played a couple of pre Christmas gigs at the Cluny in Newcastle; the first of which was filmed for future release as a DVD. The enigmatic band Gentle Giant are even on a DVD. Gentle Giant were rarely seen in the U.S.; I managed to catch their show only by accident, as an opening act for Jethro Tull at Washington, D.C.'s Capitol Centre. Leslie West and the legendary Rock band "Mountain" will also release a signed limited edition of their forthcoming live DVD. The DVD was filmed in 1985 in Paris when the band were special guests on the Deep Purple European tour. The performance includes Mountain classics such as Theme For An Imaginary Western, Nantucket Sleighride and a version of the West Bruce and Laing song Why Doncha. The signed edition signed personally by both Leslie West and Corky Laing will be limited to just 500 Copies. A film featuring the music of Mike Oldfield is also finally finding its way onto DVD. "The Space Movie" chronicles man’s longing for the stars and his dreams of journeying into space. The progress from weird and wonderful contraptions which barely got off the ground to man’s first moon landing is one of the most amazing of man’s achievements in the 20th Century. This film is a celebration of that achievement. All the footage in the film has been made specially available by NASA and The United States National Archive and includes never before seen footage of the lunar landscape. The films soundtrack was written and performed by Mike Oldfield and the films Space Symphony will have just as much appeal as Tubular Bells, Ommadwn Hergest Ridge and Incantations. These long awaited DVDs coming out, may only be a tip of the iceberg, and a trend many in the music world predict will be with us for the foreseeable future. At a recent show at N.Y.'s Iridium Jazz Club, I asked British drummer Bill Bruford if he was coming out with any more new CDs. "No, I will actually be releasing two DVDs of my Earthworks bands..." he replied. "Not even a companion CD?" I asked. "People now want to hear you AND see you," he said. "iTunes, DVDs... That's what they tell me anyway." He may be right.